25 April is a Day that Australian and New Zealanders set aside to commemorate their fallen soldiers. In the Cook Islands, it is no different. With the Cook Islands strong connection to the British Empire via a New Zealand Administration, Cook Islanders were also asked to take up arms in the two great World Wars. 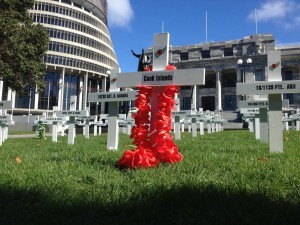 Although this ‘Day of remembrance’ marks the Anniversary of a particular WW1 event, it is accepted that this was and still is the day for New Zealanders and Australians to commemorate those who were lost in both WW1 and WW2. 2015 marks the 100th year anniversary of the landing of New Zealand and Australian soldiers – the Anzacs – on the Gallipoli Peninsula in 1915. The aim was to capture the Dardanelles, the gateway to the Bosphorus and the Black Sea. At the end of the campaign, Gallipoli was still held by its Turkish defenders. More than 11, 000 ANZAC soldiers lost their lives and among these Cook Island soldiers. Cook Island soldiers are recognized here: http://www.nzhistory.net.nz/media/photo/cook-islands-roll-honour-boards and each year on 25 April, Cook Islanders commemorate our fallen ones with a ceremony that begins at Dawn (Dawn Parade) with a march, gathering and speeches from Ex-Servicemen and dignitaries. We remember them ‘Lest we forget’.